Each program is a combination of individual program components logically connected to each other and working together to create an overall comprehensive program. Depending on the client’s needs, we select the activities for meeting the set goals for the program. Some types of activities are used almost always (icebreakers, "dynamics"), some are present only in specific programs (e.g. high ropes elements, night strategic games). Icebreakers are usually the openers of our programs. They provide the participants with an opportunity to get to know each other better, to learn each others names, as well as to get motivated for the upcoming activities. They are the ideal way to establish contact initiate communication in the group, and to start building trust and tolerance among the team members. All these prerequisits are essential for the activities that follow icebreakers during the program. 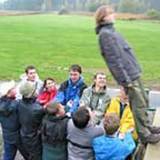 Since trust is one of the basic criteria for successful teamwork, trust building activities are a crucial component of the teambuilding programs. An increasing difficulty of these activities creates stronger bonds among the participants. At the same time, trust building activities serve as a tool to teach participants the necessary spotting techniques, which are essential for the safety of all participants during our programs. Even though trust building activities have their specific features and characteristics, their components or aspects can be observed in other types of activities described bellow. These types of activities is presented to small groups (approx. 7-10 participants) and are based on the principle of solving unusual situations through cooperation of the group members. Decision making, effective and clear communication and teamwork are the necessary prerequisites for finding solutions to the given problems. Due to this characteristic, the "dynamics" represent the cornerstone of our corporate teambuilding programs - through them we can focus on the given goals of the program - ex. communication, creative approach to problem solving, decision making, etc. As the difficulty of the given tasks increases, the group is able to complete the tasks more effectively through their improved cooperation, communication and other newly learned skills. Participants realize what role they play in the group, as well as what roles take on their fellow group members. For achieving the common goal (i.e. completion of the activity or finding the solution), all team members have to use their physical activities and soft skills, thus using everyone’s strengths and compensating each others’ weaknesses. All this can be done only through teamwork with a great deal of trust and support. Review, (i.e. 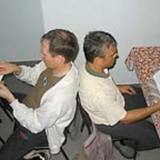 processing of the activity or a debrief), is an integral part of these activities. Problem solving activities are primarily used as tools for generating topics and materials for review and the program itself. In addition, reviews help to transfer the learned skills from the unconscious to the conscious levels of mind. 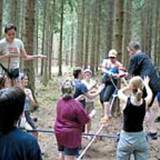 Low ropes create situations where participants overcome unusual obstacles by getting support from others. Creative approach and cooperation of team members are the two prerequisites for reaching successful solutions. At the same time, low ropes activities are very specific - they are built up to 1 meter off the ground from specialized ropes and other primarily rock climbing materials. They are designed for individuals, pairs, as well as entire groups. Overcoming of the low ropes elements requires courage, team effort, good communication and good balance. High ropes elements are positioned about 8 - 12 m above the ground. Participants overcome the obstacles either individually or in small groups. The rest of the group provides support and helps its team members in conquering their possible fears on the high ropes elements. High ropes activities create a feeling of being a part of a team (team spirit), and teach to bear individual responsibility. 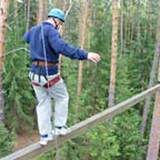 Participants’ safety is provided by seat or full body harnesses, helmets and the necessary belay equipment. Trained instructors provide belaying and guarantee safety of the participants. The construction of the elements and safety procedures during the activities are guided by strict safety standards, which have its foundation in the standards of the Czech Association of Professional Outdoor Centers (APOC) and other national and international organizations working in this field (CHS, UIAA, RCD, ACCT). 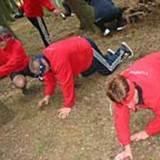 With their difficulty, length (several hours) and physical demands, outdoor strategic games represent the peak in physical activities focusing on cooperation, leadership, creative problem solving and communication in the team. All participants are divided into small teams that try to solve the given tasks. Very often the strategic games follow a legend, which is a strong motivating factor for the participants. The success of each team depends on the level of cooperation in the team. Due to the physical nature of the strategic games and high emotional effort, the activity often finishes in an atmosphere full of joy and euphoria. These activities use the outdoor surroundings of the program site. Enhancement and development of creative approaches to various situations, overcoming stereotypes, change in paradigms - these are the main foci of interest of creative programs. We use various art techniques (ex. 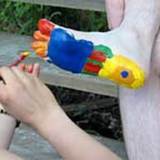 clay work) as well as unusual outdoor tasks. We introduce activities that incorporate both left and right brain hemisphere approaches.